Thermometers have come a long way from the mercury-based type that Fahrenheit invented in 1714. 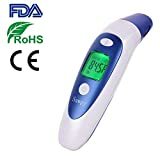 Since the European Union has banned the use of mercury in thermometers, there are a number of alternatives that exist on the market nowadays. The types of thermometers abound. You might need a thermometer for measuring your child's temperature—then you'll need a medical thermometer. Or you'll need one for weather purposes. Another possibility is measuring the temperature of a motor or other device that is too hot to approach. And just as they have different purposes, they will also have different methods of using them. Here is a guide to some of the best thermometers on the market. Liquid thermometer: Mercury thermometers were traditionally used to measure body temperature. Since the use of mercury is now discouraged (and even forbidden in some places), the use of gallium-indium-stannum (“galistan”) is starting to be the liquid thermometer of choice. 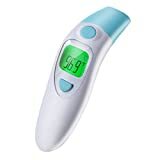 Digital Thermometers: Electronic thermometers are called “digital”, because they display the temperature in digital format. They work on a number of principles, based on how temperature can be made to influence the current in a circuit. Many of them give a “beep” when they reach a steady temperature. Some even have an application that allows you to read and store the temperature on your smart-phone. 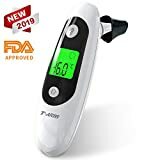 Tympanic thermometer (“Ear Thermometers”): The tympanic (ear) thermometer measures the temperature of the ear drum with an infra-red sensor (see infra-red thermometers below), and displays this on a screen. 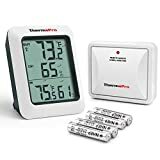 Indoor/Outdoor Thermometers: You place these thermometers in a room. They consist of two thermometers, where one reads the room temperature, and the other has a sensor to detect the outside temperature. 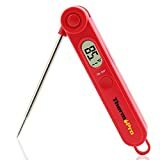 Oven Thermometers: Certain recipes demand cooking to a specific temperature. 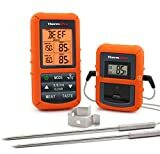 These thermometers measure the temperature inside an oven while cooking. They come in both analog (dial face) and digital types. Meat Thermometers: This is a handy cooking implement. It consists of a probe that you insert inside meat when it is roasting. It tells you the heat of the core. Candy Thermometers: These are used to measure the heat of boiling sugar solutions in preparing various types of candy. 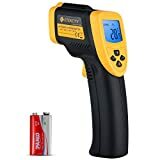 Infrared Thermometers: These are mostly employed in industry. Let's say you want to measure the temperature of an engine—but it's too hot to touch it with your hand. You aim these infrared thermometers toward the object, and it measures the amount of infrared light being emitted. Infrared light is an accurate reflection of temperature. As we noted above, the same technology is used in medical thermometers. Accuracy: The mercury-based thermometers were in use for so long because of their accuracy. Using the old-fashioned, mercury rectal thermometer are used as the “reference” as to what the body temperature really is. 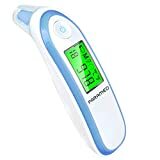 Digital and ear thermometers were found not to be as accurate, or that their accuracy would vary greatly between one brand and another. 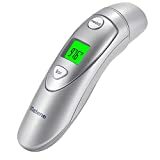 Back-light: People who use digital thermometers prefer one with a back-light. That way, they can take their child's temperature in a dark room. Response time: The liquid-based thermometers take from 6-11 minutes to measure temperature. The digital types claim to measure temperature in a few seconds. But it's always better to measure for a longer period of time: usually somewhere between 20-60 seconds is sufficient. The ear thermometers are supposed to measure temperature within three seconds. The temporal artery thermometer works by running the probe along the patient's forehead and temple. It checks that the temperature reading is uniform, and displays the result within seconds. This is a big deal when measuring a child's temperature, since they tend to be fidgety, especially when they're not feeling well. Automatic shutoff: Most digital thermometers have an auto shutoff if they are not used for a while, to preserve the batteries. Hygiene: If you are using an ear thermometer, there are lens filters that cover the tip of the thermometer's probe. You can dispose of the lens filter after use. This prevents possibly infecting someone else. Fluke—is a manufacturer of electronic test tools and software. It was founded in 1948, and has its headquarters in Everett, Washington. Their products are used in industrial and electronic service installation and maintenance, electrical systems, air quality systems, and biomedical test products. Exergen—is a company based in Watertown, Massachusetts that was founded by Dr. Francesco Pompei in 1980. Exergen manufactures thermometers and thermocouples. They market devices for industry, as well as professional and consumer non-invasive medical products. The temporal artery thermometer is their innovation, as well as over 100 other types of medical thermometers. Ambient Weather— is a company based in Chandler, Arizona. They have been manufacturing weather station and environmental monitoring instruments since 1998. 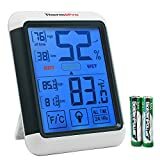 They also make consumer weather products (dew point monitors, hygrometers, thermometers, and more), and infra-red thermometers as well. Kinsa—is a manufacturer of health care products. They were founded by Inder Singh in 2012, and are based in New York. They have taken the digital thermometer and have made it into a “smart” device that hooks up to a smart-phone. 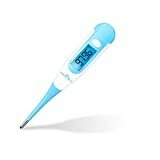 The thermometer has an application to alert users when someone has a fever, and even provide data about health in the user's general area.